Morlands Heritage Range of slippers are unique in that they are made inside out and turned. This method was developed by Morlands in the 1800s and has been the signature method of making our heritage slippers ever since. To craft a turned slipper requires skill and expertise and is a technique that many have tried but few have mastered. Why do we make slippers this way? 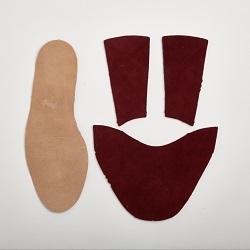 This method of production is the only method that allows a slipper to have a suede sole and it also ensures that the upper, the lining and the sole are joined seamlessly and without the use of heavy materials. The "turned" slipper is the only slipper that allows the use of a soft sole, the result of this is your foot is completely cocooned in soft and soothing materials. The combination of sheepskin and suede means that your feet are cosseted in lightweight materials, providing instant relaxation like no other slipper can. it is your feet's very own foot pampering and massage tool. Our slippers are made by hand and require dedicated skills and dexterity. Each process has its own skill set. Each pair is cut using a clicking machine. The knives follow the outline of the paper pattern, these are then placed over the sheepskin and then the clicking machine is brought down onto the knives, and the pieces are then cut accordingly. 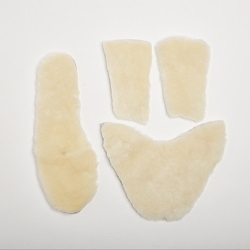 To ensure our slippers are a perfect match, each pair is cut from the same piece of sheepskin. Different knives are used to cut the suede which creates the outer material. Once again the knives are placed on the suede, ensuring that all blemishes and veining are avoided to ensure only the best parts of the suede are used. In this process the sole unit is also cut though this is from a different type of suede, one specially tanned and treated for our slippers. The cut suede pieces are sewn together whilst the sheepskin pieces are also sewn together, both done in isolation. The next step sees the skilled machinist sew the sheepskin lining and suede upper together. The slipper is sewn inside out so at this stage it does not look like your Morlands slipper. 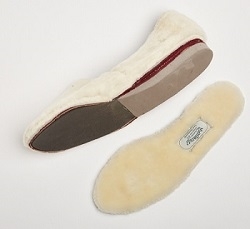 The suede sole is then sewn to the upper, so now we have something that looks like your Morlands slipper but inside out! Prior to turning, we must add the wedge followed by the sheepskin sock lining. We still have a completed slipper, albeit one that is now inside out. The next step is to turn the slipper the right way round. There is no alternative way other than by hand. The process requires strength but dexterity too as its important not to break the stitching whilst turning the slipper. Once turned, the slippers are nearly finished, but now they must take on the shape of the foot. 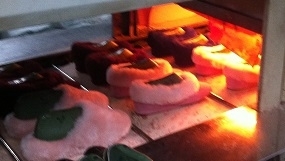 At this stage specially prepared lasts are inserted into each slipper. They are then placed on a conveyor belt and sent through a heat-set machine. This is where the slipper takes on its final shape, the materials are bonded and coerced into the foot shape. Once the slippers have gone through the heat-setting machine, they must rest! Nothing more is done to them until they have reached room temperature, thus allowing the slipper to take on the shape and form of the foot. There is no pre-defined period for this step, each slipper will cool down at different times due to the natural materials used. Once the slippers have returned to room temperature, the lasts are carefully removed to ensure the shape of the slipper is retained. The slippers are then handed over to the finishing department. Here every slipper is checked for any blemishes and loose threads. The sheepskin collars and lining are combed and the suede is brushed. Once they look perfect they are then placed ino individual bags then into a Morlands box, together with a shoe horn, providing the tools for the new owner to look after them. Now they are ready for you, please enjoy your slippers.